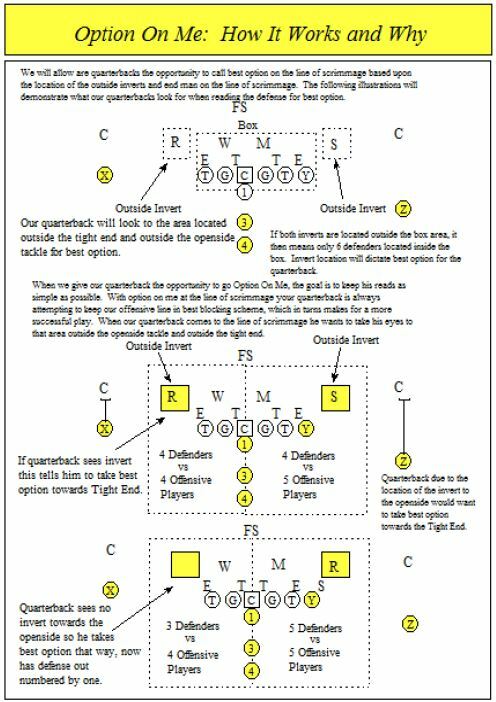 The following information gives you a reason for adding option into your offense followed by calling best option on the line of scrimmage. 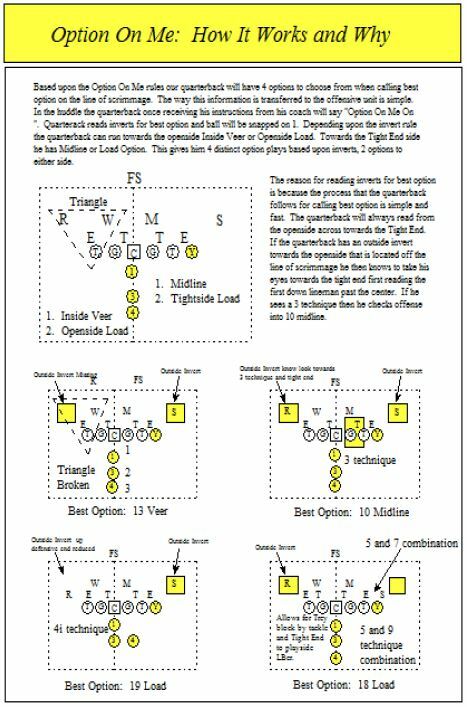 I have been involved in option football for quite a few years and found that a simple method for calling the option game was to read the over hang players (outside linebackers) for best Option. 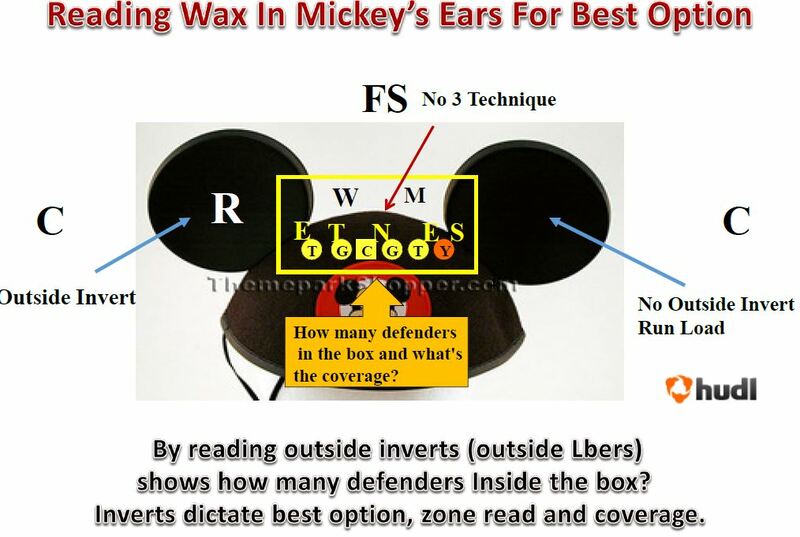 In order to keep our offense in best option I created a simple method of doing this by looking at the area located outside the box our quarterback could read for how many defenders were located in the box and the potential coverage the offense was facing on any particular play. 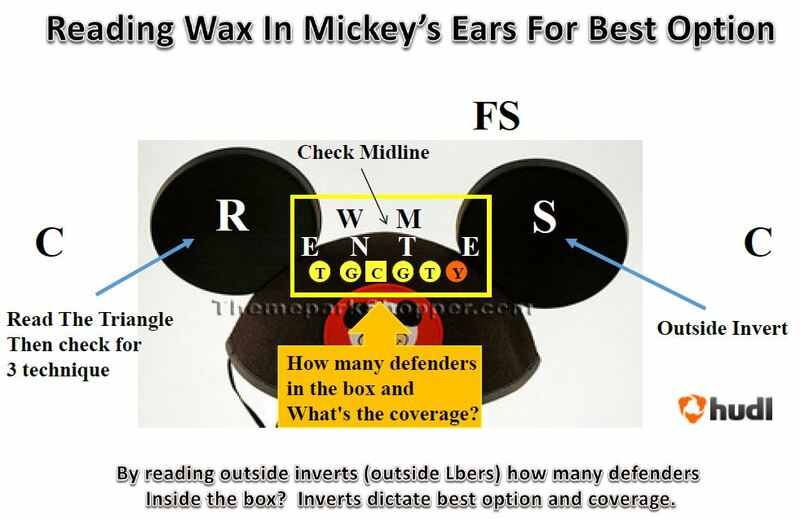 I developed a concept which I call “Reading Wax In Mickey’s Ears” for best play. The following illustrations will provide you the concept and the reasons why. I will also provide in future articles on exactly how the plays are installed. Why option football? Quite simply put, the defense can’t be right. Don Faurotin 1941 is credited with the invention of the option. Coach Faurot was a football and basketball player as well as a coach. He was at a basketball game when he made a brilliant discovery. During a two on one fast break he noticed that the offense gained the upper hand due to the fact that no matter what the defender chose to do he would be wrong. Coach Faurot realized that if he could implement this concept in football he could gain the advantage on a defense. Thus, the option was born. An offense would leave one or two players unblocked and let them chose who to defend so that the other player could continue the play. This is an offense that has stood the test of time and that many have applied into the passing game. Its strong pedigree of success makes a great case for being installed in any offense. 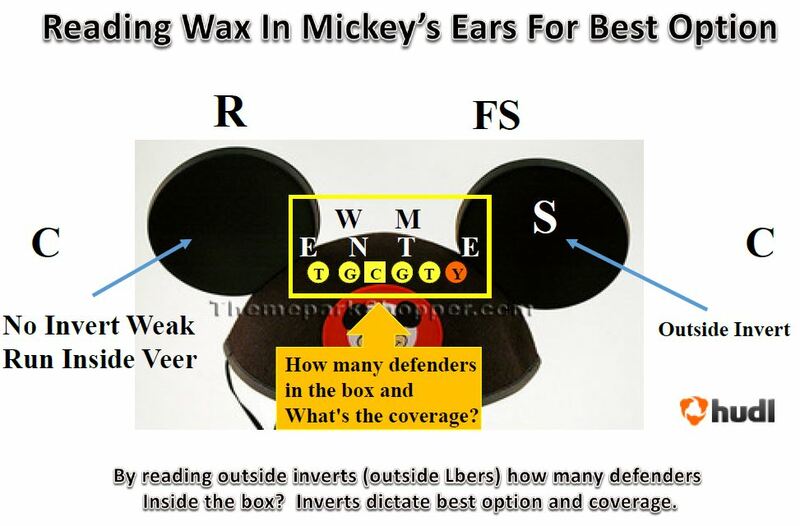 Is the best way to attack perimeter and control the box. Coach worst case scenario: What hurts the play? Is the scheme flexible versus all fronts? Pre Snap Reads are not completed until the QB’s hands are under the center!